Teams on the North side of Everest have been ly waiting for lower winds to begin their summit push. It now appears that window will emerge around May 23-26. This is a bit later than normal for the North side but still about right as that side receives more severe winds than the South. There is no hard stop to the season as on the South when the Icefall doctors, in a normal season, try stop maintaining the route at the end of May due to warming temperatures. Summits on the North can easily go into June. The lines have been fixed to Camp 3 or 8300 meters for a couple of weeks but the Tibetans stopped work due to conditions. Today the Triple 8 team of Mike and Matt Moniz, Jim Walkley and Willie Benegas successfully summited Cho Oyu and returned to ABC in a long 17 hour day. The sherpa team was lead by Nima Kanchha Sherpa (Thame), Kami Tshering Sherpa (Khumjung) and included Pemba Tshering Sherpa (Khumjung), Karchen Dawa Sherpa, (Khumjung), Phurita Sherpa, and Ang Furba Sherpa. Also in this group was Charlie Mac summiting his 5th 8000m peak with Gray Watkins at age 62 grabbing his first 8000er. On Shishapangma, a team of four French climbers reported to have summited from the South Face in a single push aka alpine style. Teams all across the Himalaya have been fighting strong winds all season with pushes delayed on Makalu and Manaslu. The only team on Manaslu is from Adventure Consultants. They have been stalled but posted today they are looking at a summit push from Camp 3 today, May 17. First summit attempt on makalu abandoned. Almost all climbers came back from C2 this morning. Too windy. However on Mike Horn’s blog it is reported his teammate Fred Roux summited Makalu today but it is unclear if Mike summited. On the North side of Kangchenjunga Txikon Alex, Adam Bielecki, Dmitri Sinev, Denis Urubko and Artem Braun are preparing for their summit push in a few days. Similar news on the south side from climbers Marco Confortola, Marco Camandona, Cazzanelli François and Favre Emrik. Russell Brice is reported to say he was no longer under investigation for helping Chinese Jing Wang with her alleged unauthorized flight. It is because of all this that I take offence to some of the diatribe from uninformed sources who would have everyone believe the Sherpas are being exploited. The Sherpas are moving rapidly forward with their own destiny unfolding before them in a very positive way. They are very much in control of that momentum that will see them succeed. Yes the accident on Everest this season was extremely tragic; we who live our lives in the mountains must frequently balance the euphoria of a shared success – with the intensity of tragic loss. Even those of us who are way too experienced at enduring the gripping pain of loss of life cannot produce an appropriate amount of emotional reckoning to balance the loss/gain paradox. That there are people who would use this tragedy to further their own negative agenda and infer that these Sherpas were working in the mountains against their will is disappointing. But Everest creates a platform that can even be used by luddites from which to grandstand their nefarious negativism to which there is little we can do except expend countless hours offering a balanced perspective so the conversation isn’t so one sided. Another update on the tragic accident comes from Mark Horrell who was there climbing with Altitude Junkies. Mark’s teammate, Mel Huang from China did an analysis of the release with annotated images. Please read Mark’s complete report on his blog. He is a talented and experienced writer and climber who maintains a calm view yet is very realistic about events. Japanese Ken Noguchi, announced a donation of 10 million yen ($97,000) to the Nepal Mountaineering Association to assist the families of the dead Sherpa. The Sherpa Fund’s of prints brought in $424,000 to aid families. 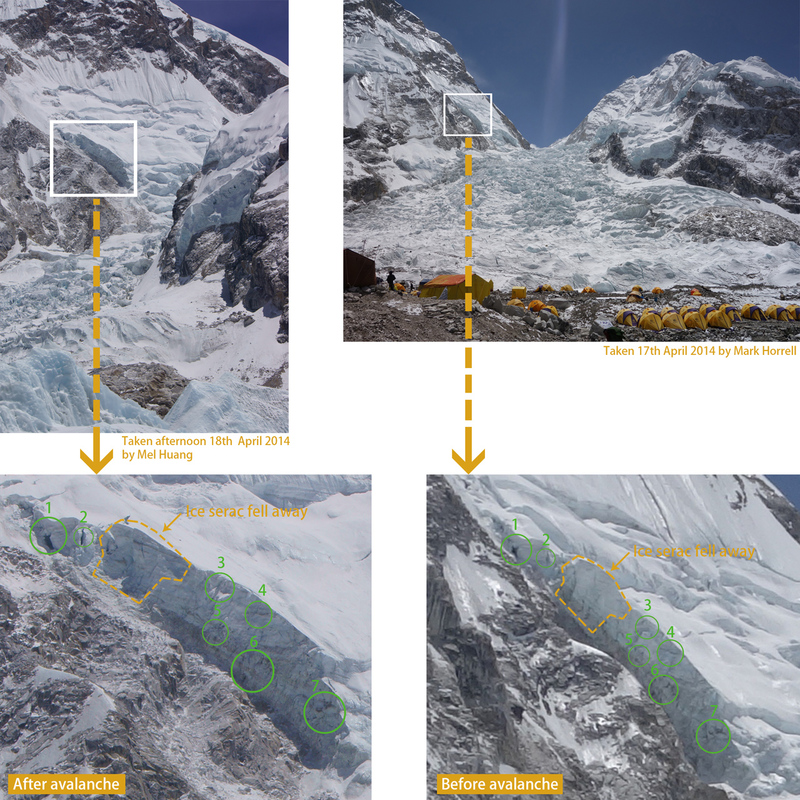 100% confirmed by Jon Miller from Rest of Everest website speaking live, in person with senior official of SPCC at Gorak Shep May 18, 2014. Cleo at Camp 3 on Lhotse Face with 2 Sherpa. One flew in directly from Kathmandu and is feeling the altitude. 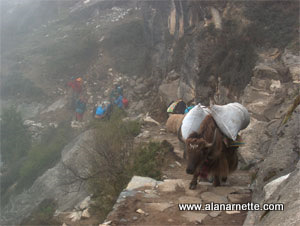 But Cleo intends to attempt Lhotse within the week. She is reported to be doing well. Jing Wang is at camp 2 in Western Cwm with 2 cooks and 5 climbing Sherpa they are on filming permit and intend to attempt Everest summit on May 24, same as North side climbers. All are reported to be doing well. A helicopter flight today. May 18 resupplied them and brought more oxygen. The SPCC, Icefall Doctors have NOT removed the ladders in the Khumbu Icefall but are not actively maintaining them. However they will if the two teams need to return via the icefall and not use helicopters after their summit attempts. Contradictory report saying Cleo was helicopter off on May 16, one day she may tell us what really happened. Here is a quick heads up on a tropical depression currently in the Bay of Bengal that might strengthen into a tropical cyclone. I have been tracking this for the last several days and now it has strengthen. At this point it will NOT make a direct hit on the Everest area and pass well to the south of our region. This is more an indication that the early stages of the monsoon season has started or is about to start. Also this should bring some additional moisture into the Everest by later on Sunday May 25 and Monday May 26 and beyond. However not seeing any heavy snow for Everest from this but this needs to be monitored. Jing Wang summited on May 23 from the Nepal side at 6:30 AM with 5 Sherpa who fixed the line so she could climb the Hillary Step according to reports. She was on a permit with Excursion Himalaya. Any news on the Maltese team climbers on the north side.? Rita, last report had them at base camp but I assume they are moving up with everyone else for the May 24-26 summit window. I would like to see (if possible) a hyperlink or Bio on the Sherpas killed or injured in the Avalanche. i am still a bit confused by some of the names as an online acquaintance was trying to figure out if one of the deceased Sherpas was a Sherpa on a ’96 team that he had met. it is difficult to find the information sometimes. thank you for the link and all you do! we are waiting for three climbers climbing from the north from our home city pune kishor dhankude and surabhi chavda & dr narendra patil among them, they are climbing with transcend and i think they will attempt the summit on the 24th, when / if i have news from them, will share accordingly. Working on it Alex, there is a lot to sort through to make a sensible post. Thanks and welcome home. Good luck to the north side teams. Hopefully they will get the weather window. Great read, are you still planning to do a piece with the interviews myself and others completed Alan?